Putting Server Player commands and Gm commands. Oracle aka MrBoiBoi wrote: Putting Server Player commands and Gm commands. 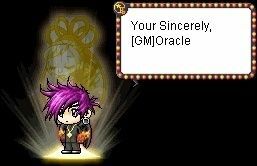 PM me for which one..
GM Commands from 1-4 Customized and some may not really work right. Place some treasure chest around(Those kind that you jabjabjab stuffs comes out). Maybe like 9% that a rare item comes out. And maybe make a map full of chests but maybe like 4%. Have a custom map that is really, really long. Then ,halfway through theres a portal. And keep going and going till the end. Of course UFJ has to be there. Not Bad but i think a map full of treasure chest is too much... the most we will accept is maybe when you walk past and you randomly saw it just like those wooden boxes in GMS! But for the flash jump contest with ufj i dont think is realistic! Let's wait for Physical to give the final answer. get him confused with this. Like crank said. Let's wait for his opinion.